I run into ‘Train Nuts” in my line of work, hell I’m one myself, and they’re particularly prevalent and around the Winter Valley. 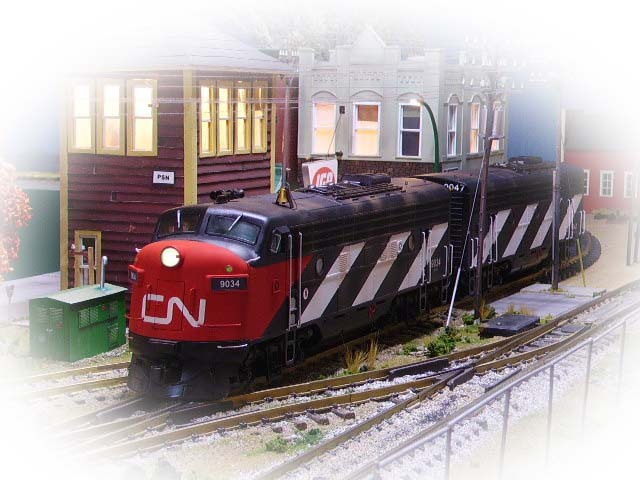 This modern short line railway offers friendly access to people and property; we run ‘traditional’ LTC (less that carload) trains rather than those boring unit trains, and we employ a variety of good looking motive power that has already become obsolete on Class 1 main line service. Ok! The scenery is pretty spectacular too. One kind’a special train nut was a good friend of mine. Her presence down at the station, usually on a Wednesday after school, was a joy for the whole staff. She was bright, with an infectious smile, and inquisitive beyond her 10 short years. She knew the schedule by heart as well as every trainman on every run. She was often allowed to relay orders to the crews given that there was always an agent holding the phone. Raegan lived in a big pink house on the edge of town and sometimes demands of the job would see me stop at the speeder shed and wait for her and her friends to get off the school bus at a nearby corner. Then I would give them a short ride up the dirt road as far as the power plant. Kids’ riding in the back of a pick-up as it bounced along a rough and dusty trail may not have been the safest kind of transportation but was pretty common out here. Along the way Raegan would wow the other kids with stories of how she ordered the trains to stop in Pearson or how she gave them the ‘ok’ to come down from the mines in Colder and stay over night in Winter Valley. The girls were amazed – the guys didn’t believe. In keeping with my theory that when you model a prairie town your modelling mostly nothing at all, much of the space on the layout between Winter Valley and Pearson is open fields with a few dirt grid roads and a slough or two next to the tracks. A line of telephone poles stands in for the “National Forest’ in much of Alberta and Saskatchewan so there are always plenty of them scattered around. The big generator was an after thought. Something too nice not to buy but nowhere for it to go when it got home. It became the stand-by power generator for the grain terminal and it’s protected by a chain link fence made out of a garlic bag and BBQ skewers. So this Saturday was Raegan’s birthday and I was actually off work. Better yet, with still two days before the big event, I had plenty of time to look for a gift. I figured it had to be something pretty special for a ten your old turning tenty-one. The hard part was that I didn’t have a clue what someone that age would need – or more important – want, but help from the outside would solve my problem. The agent in Fox Creek had brought her grand children to Scotia Town and loved it. And Scotia Town was right here in Pearson. Maxwell Hailstones was a prominent pioneer in the area. An ex-Nova Scotian, ex – Scotsman, he loved the sea and the culture he left behind to make living for himself out West. But he never forgot. A lifetime of hard work and wise investments (in the local oil industry) had paid off handsomely and what started out as a simple cabin on the lake grew into a huge tourist attraction. So, a day at the seaside was on the menu and a helping of lobster would soon have the kids excited and thoroughly messy. It would be fun for all of us. Back in the corner of the basement, almost out of sight, behind the furnace and the hot water heater, trains have to negotiate a sharp S curve, and a significant grade, in order to get from the 39” high layout up to the main 49” bench work in the rest of the room. 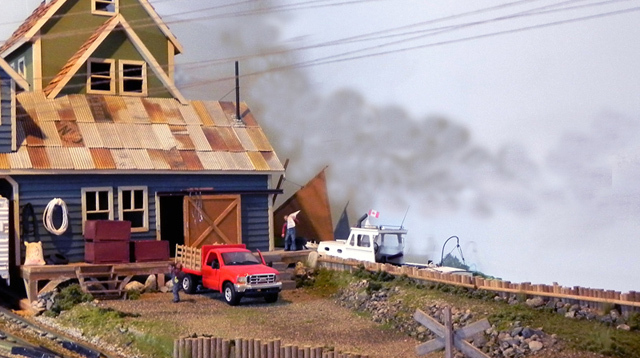 It was some time before I hit on the idea of bringing a little of our dream Nova Scotia retirement home into this prairie railway. 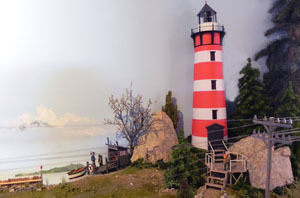 The landscape, scenery and lighting have made the seascape – prairiescape conversion almost invisible. Saturday finally arrived bright and warm for this time of year. Summer like temperatures were ideal for climbing aboard small fishing boats and listening to the waves splash against the wooden hull. The kids, eight of them, played made up games. The most popular? Who could get the big plastic lobsters out of those authentic traps set in stacks along the wharf? Then after lunch everyone ran down the hill and used what energy they had left to climb to the top of the old lighthouse. Following a funny lesson on how a real lighthouse works we all sat outside with our feet hanging over the edge while the big light rotated slowly above their heads. Who would be the first to loose their shoe and have to walk back down all those steps with one bare foot? Even before our plan for a ‘behind the tank’ project I was trying to find a way to incorporate my east coast packinghouse. The funny blue structure with the green addition and the corrugated tin roof was built specifically to hide an end wall in a basement room of a previous home. 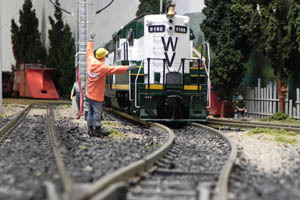 That room had been my N scale layout room – turned into my G scale workshop – and needed a GH scale feature of some kind. Moving it here presented a problem. The building didn’t come close to fitting into my prairie theme so I stuck it in a corner behind the furnace and the ‘down home’ scene grew from there. The lighthouse is an inexpensive plastic structure from Trainworld and it’s fitted with a permanent power source that keeps the light going. Friends donated various boats and other details. Soon the gifts were all open and the cake was all gone and Moms and Dads were stopping by to pick up the partygoers. Jeans, T-shirts and pretty dresses went too along with a variety of happy stains and fishy smells. It had already been a great birthday but there was just one more thing for Raegan to do, one more gift to open, and she’d been looking forward to it for what seemed like forever. Back in Grande Prairie Paul had been preparing for an important guest all afternoon. The guest must have been pretty important too because the early afternoon switching chores had been put off until evening and 8100 had been cleaned like she’d never been cleaned before. At last not since she left the big shop last year. Seems a celebrity cab ride was in order for the warehouse job. There aren’t many changes I’d make to the layout if it were all to be done again but one of them might be to try to fit a third track into the yard at Grande Prairie. I really need this pair of shop tracks AND a main line. The relatively sharp curve in the small yard is an issue as well but the room dimensions dictate that I’m afraid. Raegan read the orders she was so familiar with and dutifully read them back to the office before 8100 moved slowly out onto the main line and headed for the UGG elevator, the packinghouse and the small warehouse that was still housed in half of the old the station. Blowing the horn and waving out the left side window at friends who came to watch was a huge and lasting thrill for a little girl who loved trains. So the sun was pretty low by the time her day came to a tired, happy end. The smell of seafood and popcorn were gone from her hair and replaced with the sweet scent of oil being burned by 16 cylinders making horsepower. Time to go home. Mom was there to greet her and the balloon was still pulling on the string. How great is that? Readers know how I incorporate people from my ‘real life’ into my little stories so the story today was built around a young lady who is a Facebook friend and a helper down at our local museum display. When Raegan is with her mom next door and she sees my car parked out front she comes over to help plant HO scale figures in various places around the layout. Some places are odd but she always has an interesting story about them and why they’re there. As it should be. This bonus photo is my tribute to this month’s 50th anniversary of the CN logo. I fell in love with the design the moment it was first announced to the public and I still feel as inspired by its simple strength today. 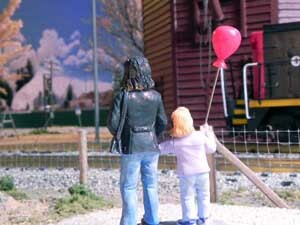 It’s probably one of the reasons I got into model railroading – even 17 years later. It just said style and class.